Bodine | Go. Do. Be Dog. You’re gonna just love this cat, I tell The Husband. Huh. What is this? Do I detect a wary tone of skepticism in that Oh? He doesn’t trust my judgment in the assessment of feline goodness, perhaps. Or I could just be paranoid. There’s always that. No, really, I insist. I’ve never seen a cat with a personality like this before. He’s so … tough. Or something. Well, he’s kinda like the honey badger of the cat world, I say. He just doesn’t give a …. you know. So if I’m understanding this correctly, says The Husband. You’re just letting me know that you’re bringing a very short psychopath into our home. With built in weaponry. Bah. You’re gonna love him, I repeat. Sharing space with two adult dogs, and an quasi-annual rotation of Canine Companions for Independence puppies, a little fella needs to have an attitude bigger than himself. So after I pick up the paperwork Bodine just knocked off the desk, we’ll celebrate his third Gotcha Day with our family. 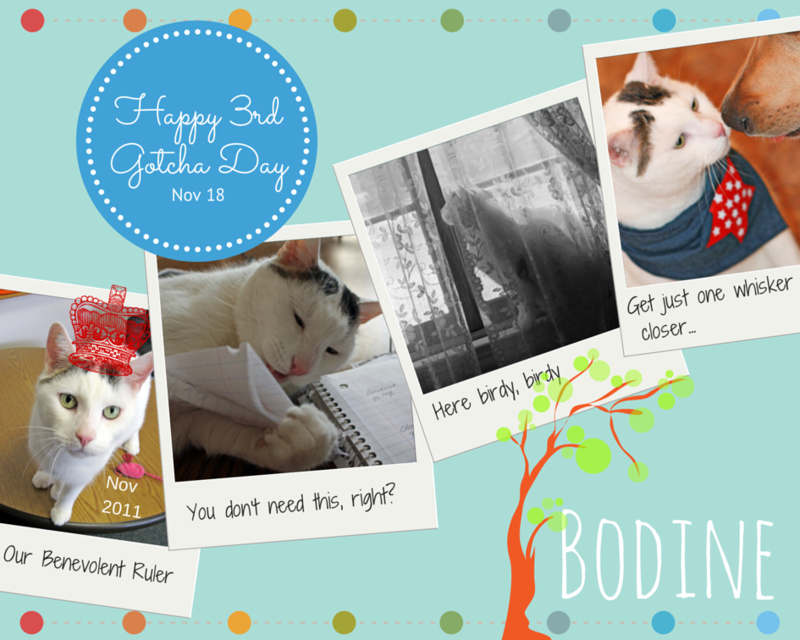 Posted in The Cat and tagged Bodine, Gotcha Day. Bookmark the permalink.